Once the corrosion and sludge deposits have been loosened and mobilised, fresh clean water is forced through the heating system, pushing the contaminated water out through a full bore dump valve to waste. During the process, radiators are individually flushed, without removing or disconnecting them from the system, by directing the full output of the pump through each radiator separately. Advanced Plumbing and Heating Services London can supply and carry out a power flush to your system, that comes with a warranty; Advanced Plumbing & Heating Services also uses the best machine and chemical to assure you get quality service from us - ask for details! Power Flushing services are all expressions used (in the heating trade over many years) to denote the process by which heating systems are forcibly cleansed using water at high velocity, but low pressure, so that no physical damage is caused to the system. The process can be made even more effective with the addition of powerful cleansing and mobilising agents such as FX2 and HYPER-FLUSH, from Kamco. HOW DOES POWER FLUSH WORKS? •What's the difference between a descaling pump and a power flushing pump? 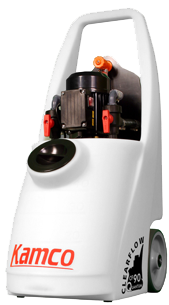 •Can I use a descaling pump for power flushing? Most smaller descaling pumps are not powerful enough to effectively flush a central heating system. They don't have the vital flow rate or the pressure needed to maintain flow against the resistance of the heating system.